Is it fleas or allergies? Many veterinarians dispense dips, sprays, or steroids without diagnosing the CAUSE of itching and scratching. The toy breed dog suffered from chronic, intense itching. "He's scratching himself bloody" said the desperate caller. He said the veterinarian had “tried everything, meds, dips and flea treatments” and now wanted to put the elderly dog on prednisone, a powerful steroid. He had asked the vet about side effects, knowing steroids can cause problems in people but the veterinarian assured him it was “different” in dogs and not to worry about it! Veterinarians who dispense steroids without diagnosing the CAUSE of the ALLERGY (often the heartworm prevention meds he prescribed), are incompetent or dishonest. Had the vet been honest, the owner might not have called TheDogPlace.org Thank goodness he was a rational owner. He saved his 12 year old dog's life. Any unsolved chronic condition clearly indicates misdiagnosis. If the dog fails to improve, well duh! it proves the treatment is inappropriate. Another tip-off: the veterinarian did no referral, i.e. he was too concerned about losing the client (money). He lied to the client regarding potential side effects of steroids while at the same time, the vet was already talking about euthanasia to cover his mistakes. Depressing a dog's immune system with a barrage of chemical flea dips, sprays, and heartworm prevention will worsen the condition. I confirmed there were no environmental changes such as new carpet, cleaning, yard pesticides or dietary changes (see below). It is summer so the dog's itching and scratching isn't caused by dry heat from a winter heating system. The owner says his wife complains of dry skin in the winter. He makes a note to buy a humidifier before winter. Smart guy. “The vet put him on this special allergy diet but it hasn’t helped.” Do you give him fresh foods, like meat, veggies, apples, grapes, bananas? “Oh no, the vet said no table scraps and that grapes can kill him.” In my opinion, his veterinarian should be put to sleep! Dogs love seedless grapes, I’ve fed them for over forty years but raisins are not “just dried grapes.” I explain nitrates, sulfates, curing process. He gets it. I tell him just Google TheDogPlace/grapes to learn more about "food" allergies. My standard questionnaire ends with a discussion on commercial food. Would you raise your child on nothing but Total Cereal? “Of course not!” he replies. Then why would you do that to your dog? No packaged food is total nutrition. He laughs, “Wow, I get it!” I also explain that dog food is loaded with chemicals, excitotoxins, and addictive flavor enhancers, any or all of which can cause allergic reactions, i.e. itching, scratching, foot licking, even chewing the feet. I explain that heartworm preventative is a systemic poison. Itching is a common reaction but chewing and licking the feet is particularly characteristic of heartworm medication allergy. We discuss risks vs. advantages including; indoor dog in upscale neighborhood, I explain the mode of heartworm transmission and little-known facts about mosquitoes. I advise him to stop commercial dog food for two weeks to allow the dog's system to flush out any allergens. Feed cooked veggies, fish, poultry, meat, plus a very small amount of carbs such as oatmeal, quinoa, or sweet potatoes. He asks about brown rice. It is hard to digest and overrated by rice growers and dieticians who never eat it. He laughs, says he never eats it either. Explained advantages of meat and that the canine digestive system handles stuff that can sicken humans, pointing out only humans cook their food. He chuckles. A balanced home diet is also cheaper than prepared foods. He doesn’t care about cost but agrees. Stop all flea dips, sprays, and chemical baths. 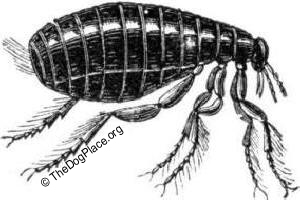 They are only effective for contact dermatitis caused by fleas (which we have established is not the culprit) and can actually exacerbate itching and scratching. Explained canine ph balance, suggested a quality pet shampoo followed by apple cider vinegar rinse to calm and disinfect lesions. I point out that nature does not make a host "allergic" to its natural parasites. No such thing as "flea allergy". He thoughtfully agrees. This devoted owner is highly intelligent, a quick study. He is saddened by the experience and inadequacy of the average veterinary practice. Me too. He thanks me, then says "Thank God I refused to allow that vet to 'destroy the evidence.'" He sighs, then exclaims "I just saved my dog's life!" Most 12 year old toy breeds can expect good health for several more years so yes, this man saved his dog's life. I’m confident this is another “case solved” especially as my final recommendation was to find another veterinarian! 86% of chronic allergies can be environmentally corrected. is usually whole-body poison so kill the bugs, not the dog.